Getting a blog established is a real labour of love. There are so many bloggers out there working hard to sustain their blog and gather a following of loyal readers, but it’s a competitive game and unfortunately many go unrecognised. That’s why we have come up with our ‘One to Watch’ blogger award. The idea is that if you know of a blogger who is producing great written or visual content, posting all hours to get established…or even someone who’s doing something a little bit different in the sphere of blogging, and who you feel is a worthy recipient…then you can use our ‘One to Watch’ blogger award to help get them noticed. We hope this award will give some newly established, up and coming bloggers a much-needed pat on the back and boost of encouragement, from some fellow bloggers who recognise a good blog when they see it. If you are nominated in the future, please read the below rules and then embed one of the ‘One to Watch’ badges onto your site. We’ll also be RTing the nominees, so you’ll get some extra exposure via our own social accounts. You must be nominated by another blogger first. In your blog post, list 5 – 10 of your own blogging highlights so far, and describe why they are highlights! Nominate 5 -10 other bloggers, who you consider are ‘One to Watch’ bloggers. In addition, link to their blogs from your acceptance blog post. Link to this page the ‘One to Watch‘ from your blog post. Grab the nominated ‘One to Watch’ badge from the Bloggers Required website (bottom of the page) and embed it on your acceptance blog post and sidebar, to show you are a nominated ‘One to Watch’ blogger. Make sure you also add the name or URL of the bloggers’ blog that nominated you to the badge. The embeddable badge links to this page, but you are more than welcome to remove our link and add the URL of the blog that nominated you. *IMPORTANT > Be sure to let your nominations know you have nominated them via Twitter, Facebook, email or contact form found on the nominated bloggers blog. Please do all you can to make sure your nominees, nominate. Example Tweet/Facebook message: My ‘One to Watch’ blogger nomination go to @Name of nomination @Name of nomination @Name of nomination @Name of nomination @Name of nomination @Name of nomination (Link to your blog post) #BRO2WA. *If you nominations don’t carry on nominating the ‘One 2 Watch’ blogger nominations will come to a grinding halt! Share your final post across social with the hashtag #BRO2WA. An example published post tweet: I’ve been awarded a ‘One to Watch’ blogging award by (@name of the blogger who nominated). Find out who my nominations are. (Link to your blog post) #BRO2WA. Title: I’ve been nominated as a ‘One to Watch’ blogger by a fellow blogger (@name of nominator) Find our who I’m nominating. Thank you (Name of your nominator) for nominating me for the ‘One to Watch’ blogger awards created by Bloggers Required. 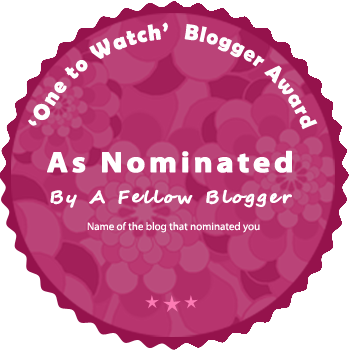 To all my nominees, go grab a ‘One to Watch’ badge, and create your acceptance and blogger nominations post. You deserve it! Here are the ‘One to Watch’ blogger rules. End of example blog post. Before you can nominate, you have to be nominated. If you are nominated in the future, please embed one of the below badges onto your site. Simply fill in one of the forms (select the correct size) below to generate a badge for your blog. IMPORTANT: After you click submit, scroll back down to copy and paste the enbed code into your blog. This will be shown on the badge. Add your blog URL here. So we can send you a little reminder to nominate! IMPORTANT: After you click submit, scroll back down to copy and paste the code.